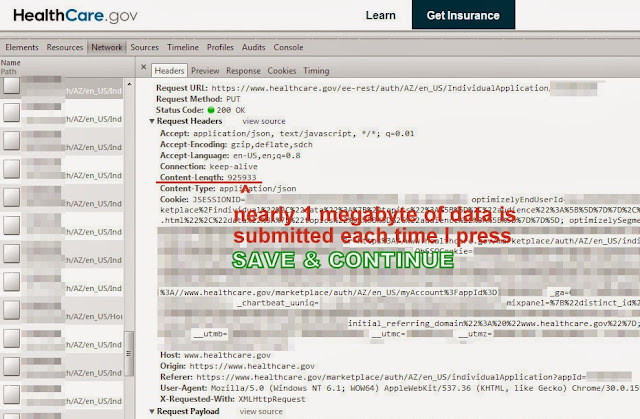 The Healthcare.gov insurance application process is slow and repetitive for multi-person households. 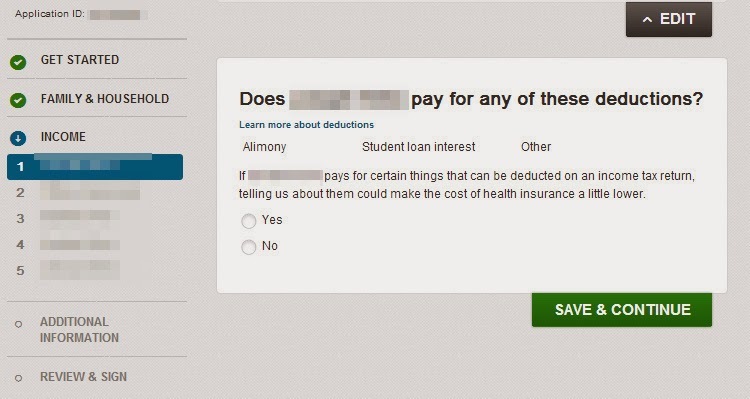 It asks the same set of questions about each member of the household -- whether they are applying for insurance or not. Rather than put multiple items on a single form page, the system asks for one or two pieces of information at a time. To proceed to the next question, the applicant must press a SAVE & CONTINUE button. As I proceeded through an application, I noticed the delay between my pressing SAVE & CONTINUE and the presentation of the next question was getting rather long -- often requiring I wait 10 to 20 seconds, or more. Chrome's developer tools confirmed that it is indeed taking taking a long time to submit data with each press of a SAVE & CONTINUE button. Every time I press a SAVE & CONTINUE button, the entire application and the results of all processing (data retrieved by back end systems, and history) are resubmitted to the server, and the entire results are then returned by the server. In my case, this was nearly 1 megabyte of data. The good news is that the response is gzipped, and only about 50 kilobytes. However, the data is sent to the server uncompressed -- nearly 1 megabyte of data each time I progress to a new application question. Nearly 100 of these exchanges occurred as I completed my application. Submitting the entire application (and results of back end data lookup) at every step slows an already tedious process. It also adds unnecessary load on the Healthcare.gov networks and servers. This is not how one designs a high-performing web site. My average wait between "saves" has been 12 seconds. Additionally, why can't I edit one section of the application? If I choose to make changes to a particular section, I must complete the remainder of the application from there going forward. I'm on my 3rd round of applications for 2016! SO frustrating! I am having part of this same problem. It wasn't too bad until I got to the last section, "Additional Information" (at least I hope to God it is the last section), and it's taking several minutes for it to save and continue before going onto the next question - 1 question at a time, save and continue, and on and on. And I don't know how many more questions there is going to be but I'm about to go insane! To top it off, behind each question, it says "optional", so even if you don't click on either the yes or no box, it still makes you click on the "save and continue" button between each question - and wait and wait again - Arrrggghhhh!! !